indeed, think of the ground we could cover on skis ! Hi Crew, anyone interested in the Treasure Hunt needs to contact Steve early as there is limited numbers for the event, should be a fun day! Can you launch at eastern beach? what sort of ramp is there? what time will it go to as im going to the simply red concert in the afternoon. Hi Chris, there is a good ramp at the South end, you just have to watch the tide! It goes out like a bath tub, I am pretty sure you have enough tide 3 hours each way of high tide. 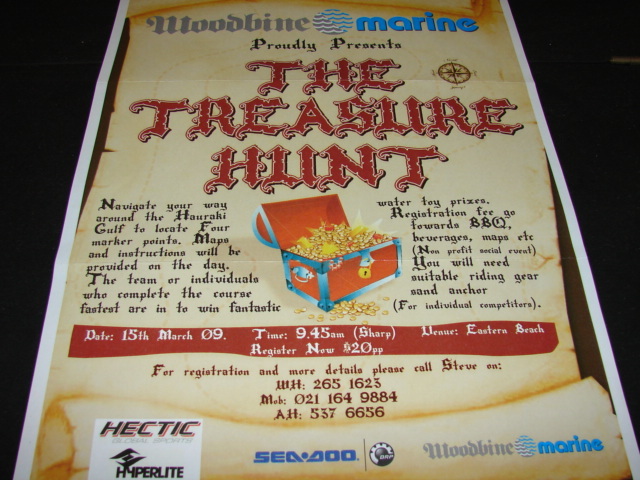 The treasure hunt is this weekend, any interested need to register before this Saturday at Woodbine Marine, should be a fun morning as all their events are.